You never know when you might find yourself in need of a seat. 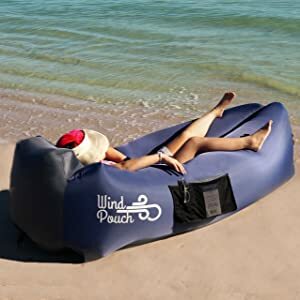 Whether you’re looking for comfort for your day on the beach or an extra spot to relax on your camping site, an inflatable couch is a convenient option. 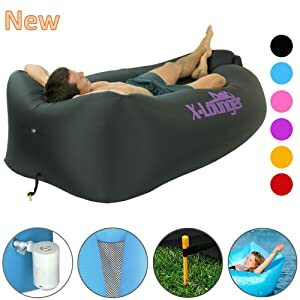 Let me help you check out the different features and choose the best inflatable lounger for you! Why Choose an Inflatable Lounger? There are many situations in which you may desire seating that does not exist. Or perhaps there is seating available, such as beach chairs, but the seating fills up quickly. In cases like that, you want to have an option to ensure your comfort. Compact and lightweight for carrying and storage. If you’ve ever seen a picture of an inflatable lounger or seen one on the beach, then you know that they are very big! But don’t be fooled by how big they are blown up. Once they are deflated, they fold down and become compact and neat. Generally, inflatable couches come with carry bags in the style of string backpacks. Imagine how much easier it would be for you to carry a lightweight, soft backpack compared to a heavy, folded standard style beach chair! With such compact and easy storage, you’ll be able to head to different locations without any extra struggle. Do you need to walk up and down a lot of stairs to reach a specific beach? No problem. You won’t even remember that you’re carrying a chair as it sits in a string bag on your back! Not only will transporting your blow up chair be super easy, but you also won’t need to worry about taking up too much space in your car. That means more room for other things like coolers of food and drinks to help you enjoy your time! Your inflatable couch fits in a soft, string back that can be fit into small spaces for storage without a lot of hassle. So there are many inflatable chairs available. They all offer the benefits of comfort and easier storage. But what not all of them offer is easy inflation. You want to make sure that you look for chairs with the simplest inflation process! Why? Because there is no reason to struggle when you can have an inflatable chair up and ready in just a minute or two. With inflatable loungers, all you need to do is hold the lounger up and fill it up with air. If it’s windy then you’re really in luck because it will fill by itself in a matter of seconds! On a day with less wind, it’s still easy to inflate. All you need to do is swing the lounger in one direction to fill it with air. Or you can run a short distance with it, if you prefer. No need to carry and fidget with any air pumps! 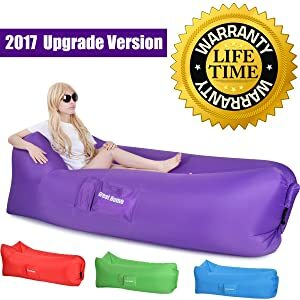 If you choose to use an inflatable lounger, you will find extra value. Using it as a comfortable recliner for the beach or your camping site is a given that you will be happy with. But you will also be able to use your lounger as a water float! Your comfort on land and in the water can be taken care of by this one inflatable lounger. It will create a really flexible experience for you and expand the potential for fun! One of the best parts about standard canvas camping chairs is that they usually have cup holders on the arms. But let’s face it, while this is helpful, it’s also a bit limiting. Not much can fit in those cup holders. Inflatable air loungers are ahead of the game with this function. 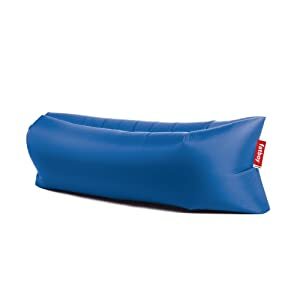 Many inflatable couches come with pockets on both sides. These pockets are created to provide flexibility in what you’d like to keep in them. You can keep your drinks, sunglasses, books, and any other smaller items that you can think of in these pockets. These pockets are a great feature that really add to the functional and practical value of inflatable loungers. 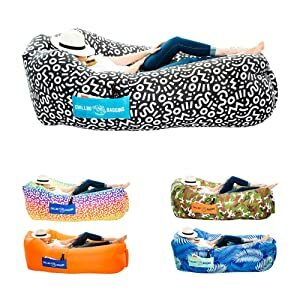 One of the funnest perks of having an inflatable lounger is that they are available in a large variety of colors and patterns. You don’t need to settle for a muted or undesirable color. You will have the opportunity to express yourself through the color and pattern of your blow up chair. The people around you might just ask to join in on your fun! With the Chillbo Baggins Inflatable Lounger, you will find yourself able to easily hop to and from different types of locations all while using the same seating arrangement. You can choose between a few different colors and patterns to customize your seating experience to your liking. Very easy to fill up with air, you’ll be ready to relax in just a couple of minutes. The lounger is made from strong material that doesn’t make disrupting noises every time you want to adjust your position. Customer service is very communicative and helpful is you experience any issues or simply have questions. Stays inflated for long durations of time even when there are multiple people lounging. It is long and strong enough to hold multiple people, as it holds up to 400 pounds total. Has a pocket on each side, but at opposite ends of the lounger so that you can sit comfortably on either end and still have convenience. Comes with clear and helpful instructions for inflating, deflating and storage. The convenient and compact carrying bag comes in the same color or print as your lounger. A bit pricier than some other brands of inflatable lounger. You can make your way to different locations for different levels of relaxation with the Chillax Inflatable Lounger, all while knowing that you are covered with a lifetime warranty. Available in a variety of colors and prints so that you can choose a lounger that you’ll enjoy looking at while you relax. Comes with a bottle opener for added convenience while you camp, spend a day at the beach, or jam at a music festival. as 3 useful pockets that fit, respectively, your phone, a bottle, and a book. Floats just as comfortably in water as it rests on land. Holds up to 400 pounds for enjoyment by more than one at a time. Very fast and communicative customer service. Deflates into a very compact size which is ideal for easy transport and storage. Comes with a stake to hold down the lounger on especially windy days so that it doesn’t blow away. More comfortable than a standard beach or camping chair. The headrest provides added comfort and convenience whether you’re sleeping or just relaxing. Harder to inflate than it seems in the videos, there is a bit of practice needed. The Live Infinitely Air Lounger is an excellent and convenient choice of portable seating for your various adventures, that is available in many different colors for your unique taste! Air lounger can hold up to 500 pounds total so there is room for more than one. Very easy to fill up with air either with a breeze or a little jogging to bring the air in. Floats well and comfortably in the water for double purposing. Anchor below headrest helps to hold down the lounger when you’re not relaxing on it during windy days. Side pockets are really useful for holding things like your cell phone while you relax. Deflates easily and becomes very compact for easy transport and storage with a carrying bag. Extra long size is good for taller people. Headrest provides comfortable neck support for reading and relaxing. Can be used for many purposes and in many locations. Comfortable enough to replace alternate beach chairs and even for napping. Size is so long that it takes a bit of extra effort to fill up the whole lounger with air. May need to refill with air a couple of times during your day, as it loses air moderately. The XYH Inflatable Lounger Couch provides an affordable and comfortable alternative in seating for a lot of situations and experiences. Stays inflated for long durations so that you can enjoy yourself without having to refill your lounger too often. More affordable than some other brands of loungers, making it an option accessible to all. Side pocket with both big and large inserts for holding different types of items while you relax. Comes with easy-to-follow and helpful instructions for inflating and deflating the lounger. Inflates easily with natural air and you can also use an air pump if you prefer. Lengthy enough for taller people to relax comfortably. Floats well in water for comfortable and enjoyable relaxation and fun. You can fill it up certain amounts depending on the size of chair or couch you want, meaning that you do not have to fill the whole thing with air each time you use it. Double layer of fabric makes for sturdier build. Stitching rips more easily than some other brands of loungers, therefore more care must be taken when using this lounger. This lounger makes a bit of a crinkly noise when you adjust your position, which may be disturbing when sleeping or relaxing quietly. 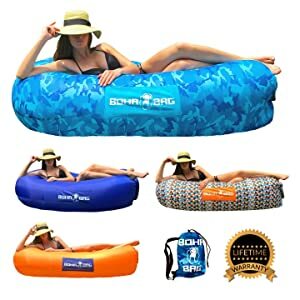 The Inflatable Lounger Boho Bag is an affordable option for all to carry easily to the beach, camping, music festivals, and to many other places. Four unique color patterns to choose from for your lounger. Helpful and entertaining instructions are included with your lounger to make the process easier for you. Comes with a peg tie down so that you can secure your lounger on especially windy days and prevent it from blowing away. Made with good quality nylon which feels like a parachute and is very durable. Holds multiple people comfortably even when used to float in water. Comfortable enough to enjoy naps throughout your days in different settings. Deflates and become very compact and fits into its own carrying bag which makes transport and storage convenient. Lounger is quite long and works well even for taller people. You many need to reinflate multiple times throughout your day as the air seems to leave somewhat easily. Difficult to inflate without a decent amount of wind, unless you use a fan of some sort. 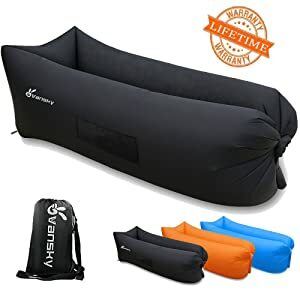 The Vansky 2.0 Inflatable Lounger Hammock provides comfort and convenience for various enjoyable activities such as camping, festivals, and beach days. Very affordable price makes it an option feasible for most people. Easy to inflate once you watch instructional videos and practice a few times. Lounger is long enough for taller people to lie down comfortably. Comes with simple and understandable instructions for inflation, deflation, and storage. Deflates into compact size that fits into an easy to carry bag which makes traveling and storage very convenient. Company provides thorough and helpful customer service. Very durable build that does not rip or pop easily. Made from smooth, lightweight fabric that is very easy to clean. Side pockets that hold objects such as cell phones, books, and bottles are convenient for relaxing while keeping your things close. Wide, square headrest provides solid support for both neck and back. Black color lounger absorbs a lot of heat on hotter days and feels hot to the touch. Does not come with a stake to keep it from blowing away on windy days. The X-Lounger Inflatable Lounger is a comfortable seating option available in various colors while providing convenience and flexibility. Reasonably priced compared to other loungers available, making it a plausible option for many people. Available in a variety of vibrant colors to fit your personal style. Triangle shape creates greater width and therefore more flexible comfort. Designed to provide option of inflation with or without air pump depending on your preferences. Square headrest provides extra support for your neck and back. Side pockets can hold your things such as cell phones, drinks, books, and more. Made with durable, tear-resistant nylon that means your lounger will not rip easily. Comes with compact and lightweight carry bag making for painless travel and easy storage. Holds air very well for around eight hours at a time so you will not need to refill your lounger too often. Includes an air pump that can be replugged using a USB connection. You need to fill two air chambers which may prove difficult to do evenly for optimum comfort level. If not secured properly, the air valve meant for inflation can start to leak air and deflate your lounger rather quickly. 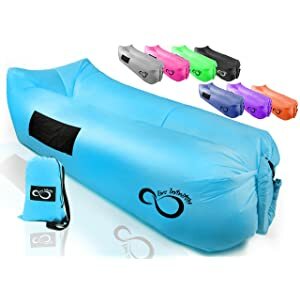 The Great Home Inflatable Air lounger is an affordable option for comfort and convenience for any number of different enjoyable activities and adventures, including camping and beach days. Affordable price makes this lounger a practical option for all who are interested. Very easy to inflate and can be done by people of all ages with minimal difficulty. Only has one air chamber which makes it easier to fill than many other brands of loungers which have two separate air chambers that must be filled. Wide headrest provides helpful and comfortable support for your neck. Comes with a carry and storage bag that can be worn like a backpack for convenient traveling with your lounger. Side pockets which can hold things such as your cell phone as you relax. Available in a variety of colors to best fit your taste. You may find yourself feeling sticky and sweaty if relaxing on a particularly hot day, and it is best to lay out a towel underneath yourself. Not as long as some other brands of loungers which is not ideal for taller people. Does not have an inner liner so more caution and care is necessary to ensure that it does not rip. The Original Lounge Chair provides a simple yet comfortable experience for you and your friends or family with its ability to hold multiple people at the same time. Is very sturdy and can hold up to 440 pounds total making it a great option for group relaxation. Nylon material does well in repelling dirt and water to keep the lounger comfortable. Very easy to clean the lounger with just a cloth and some water. Comes with a compact carrying bag for easy transport and storage. Different colors and patterns to choose from to best suit your style and personality. Fatboy provides trusted and quality performance and customer service. Easy to fill with air once you get the hang of the process. Can be filled up quickly using a box fan if the day is not as windy as desirable. Seems to deflate rather quickly so you will need to refill it a few times during your day. Rips and pops more easily than some other brands of inflatable lounger so you need to be more careful where you place this lounger. No pockets on the side of this lounger which means no extra convenience in terms of holding things such as cell phones. Your WindPouch GO Inflatable Hammock will provide a simple yet comfortable and easy relaxing experience that you can bring with to a variety of different settings and situations. You get to choose between a few vibrant color options to personalize your lounger. Comes with a bottle opener and a water resistant carrying bag which makes transport easy in all types of weather. Good for supporting multiple people at a time as it holds up to 500 pounds at once. Company provides a lifetime warranty for your lounger. Works well and is comfortable both on land and floating in water. The headrest provides extra comfort, neck support, and convenience if you feel like reading, as well. Side pocket convenient for holding your things such as your cell phone, book, sunscreen, or anything else while you relax. Very durable design including triple-stitching protects against easy ripping. More expensive than some other lounger brands which makes it an option that may not be feasible for all. Make sure that peg is held down well otherwise your lounger may blow away if it is especially windy. 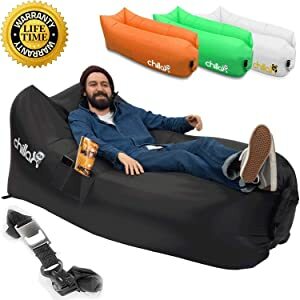 After comparing the top 10 best inflatable loungers, our choice for number one is the Chillbo Baggins Inflatable Lounger. This is our first pick because it provides the expected comfort and convenience along with the ability to choose a color or print that suits your personality. 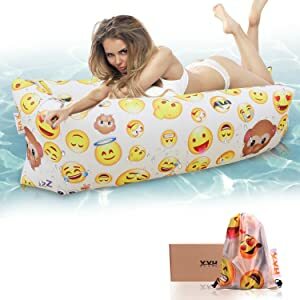 With a Chillbo Baggins Inflatable Lounger, you will find yourself at the peak of your relaxation whether you are on the beach, in your pool, camping under the stars, or listening to great music at a festival. You and your friends with enjoy sitting together on your lounger without the stress of a difficult setup or heavy transport to different locations. A Chillbo Baggins Inflatable Lounger will provide you with a flexible experience each time you use it. Hi, just wanted to share with you that we had a great vacation at Marina de Bolnuevo in September of this year. We flew into San Javier and hired a car from the airport for the short drive to Bolnuevo. The beaches are perfect, most of them awarded the Blue Flag. The restaurents were great, with paella on the beach a highlight and managed a trip to the nudist beach there. Very liberating. We also visited the Big Guns, The Roman Mines and the Sand sculptures. Will be returning there again in 2018. Thanks for reading Niall. If they say they are not suitable for water then they are more than likely not suitable for water, common sense people. It’s unfair targeting the people who make and sell these items if you are not going to use them correctly. We have one. It was entertaining running through the house attempting to inflate it. Finally used a fan, then it was not very comfortable at all. I agree with many comments on here, it is not worth much of an investment. If you find one for cheap like I did then go for it, just for the experience at least! Enjoy ours at outdoor community events. We blow it up with air pump or hair dryers. We are not able to blow up by swinging motion as videos show. Its Texas and there’s never a summer windy day. Ours do not leak. Purchased from academy sports. Fun for friends on movie night too. My mom got one for her birthday last year and it’s amazing. Also, 3 4yr olds, 2 2yr olds, and a 7yr old can jump and play and have the time of their lives on it for hours and there was only 1 minor thread pop that was easily fixed. I bought one last year, its still in my shed. They make it look so easy to put up. Nice post. With Inflatable Lounger you can pack the lounger and take it along with to you beach, concert, or even just outside of your living room.